General Order No. 1 – Fix Bayonets! Mr. Denby was not a joking man. Mail robbery had become a very lucrative business between 1919 and 1921. According to an article by Postal Historian George Corney, about $6 million was lost to mail robbery during these years. In terms of today’s dollars, that would be about $80 million. Train/postal robbery was a worthwhile endeavor back then because registered mail is how most businesses and persons transferred money from one location to another. The worst robbery of all took place in New York City —the loss of $2.4 million in five sacks of registered mail. Today, that would be about $31 million. You will detail as guards for the United States Mails a sufficient number of officers and men of the United States Marine Corps to protect the mails from depredations by robbers and bandits. You will confer with the Postmaster General as to the details, and will issue the necessary instructions in regard to the performance of this duty. Question: Suppose he (the robber) is using a gun or making threats with a gun in trying to escape? Question: Is it possible to make a successful mail robbery? Answer: Only over the body of a dead Marine. Of course, so few Marines could not guard every bit of mail and so the Post Office Department decided that Marines would only guard registered mail consisting of a considerable value, particularly mail involving cash and negotiable bonds. The post office consolidated these shipments as much as possible in order to reduce the number of Marines required for such duties. Marines assigned to these duties may have imagined that it was a plum assignment, but it actually involved long, tedious, lonely hours. Not one time during the initial period of guard duty did anyone attempt to rob the U. S. Postal Service. 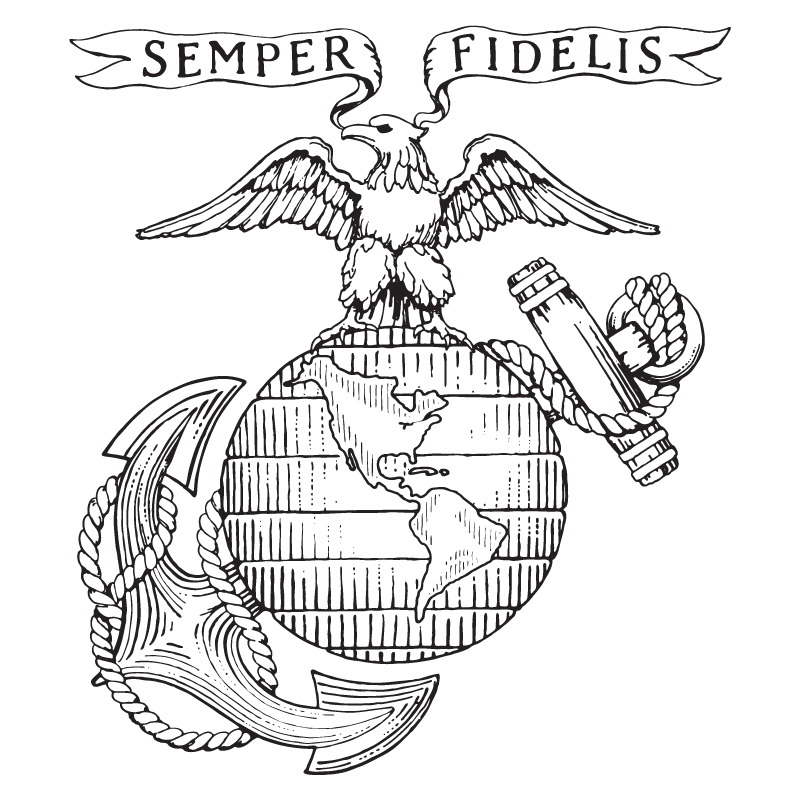 Marines were withdrawn on 15 March 1922. The break in robberies continued until in April 1923 when a mail messenger in St. Louis was relieved of $2.4 million of registered mail, and a general reescalation of robberies in 1926. In October, a group of gunmen murdered a postal truck driver and made off with $150,000. Once again, the Postmaster requested Marines to guard the mail while the postal service developed its own force of guards and armored trucks. Once again, the Commandant of the Marine Corps detailed 2,500 Marines to postal security duties, this time under the command of two-time Medal of Honor recipient Major General Smedley D. Butler (West Coast Operations), and Major General Logan Feland (East Coast Operations). All 2,500 Marines served on Mail Guard Duty. By 1926, gangsters had upgraded their firearm capability. Now they were using automatic rifles and machineguns. Marines responded in kind, adding Thompson sub-machineguns to their arsenal of .45 pistols and shotguns. This time, a Marine did fire his weapon. 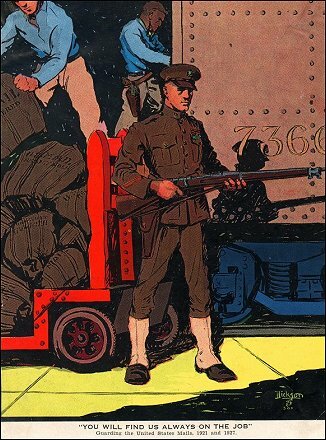 On the night of 26 October 1926, while detailed to a Seattle bound train, Private Fred Jackson discovered an intruder standing on the mail car platform. In spite of the fact that the train was traveling at about 25 miles per hour, Private Jackson ordered the man off the train. The man told Jackson he wasn’t going to do it. Jackson fired a shot above the man’s head, which caused the interloper to rethink his position. As the man jumped from the train, Jackson fired a second shot for good measure. Today this would result in a White House investigation. Marines were withdrawn from Postal Security Duty in February 1927; they were needed elsewhere. The Banana Wars were once more heating up. A lost piece of US history indeed. Entirely new to me. But what struck me was the truth in your inference there would be an investigation ordered by the White House. Then again, it would depend on the races involved. Sad times indeed.